1. Nerve impulses to and from the brain travel as fast as 170 miles per hour. Ever wonder how you can react so fast to things around you or why that stubbed toe hurtsright away? It’s due to the super*speedy movement of nerve impulses from your brain to the rest of your body and vice versa, bringing reactions at the speed of a high powered luxury sports car. 2. The brain operates on the same amount of power as 10*watt light bulb. 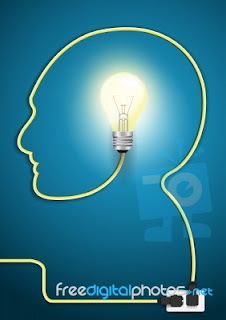 The cartoon image of a light bulb over your head when a greatthought occurs isn’t too far off the mark. Your brain generates as much energy as a small light bulb even when you’re sleeping. 3. The human brain cell can hold 5 times as much information as the Encyclopedia Britannica. Or any other encyclopedia for that matter. Scientists have yet to settle on a definitive amount, but the storage capacity of the brain in electronic terms is thought to be between 3 or even 1,000terabytes. The National Archives of Britain, containing over 900 years of history, only takes up 70 terabytes, making your brain’s memory power pretty darn impressive. 4. Your brain uses 20% of the oxygen that enters your bloodstream. The brain only makes up about 2% of our bodymass, yet consumes more oxygen than any other organ in the body, making it extremely susceptible to damage related to oxygen deprivation. So breathe deep to keep your brain happy and swimming in oxygenated cells. 5. The brain is much more active at night than during the day. Logically, you would think that all the moving around, complicated calculations and tasks and general interaction we do on a dailybasis during our working hours would take a lot more brain power than, say, lying in bed. Turns out, the opposite is true. When you turn offyour brain turns on. Scientists don’t yet know why this is but you can thank the hard workof your brain while you sleep for all those pleasant dreams. remember many of our dreams and the average length of most dreams is only 2*3 seconds–barely long enough to register. 7. Neurons continue to grow throughout human life. For years scientists and doctors thought that brain and neural tissue couldn’t grow or regenerate. While it doesn’t act in the same manner as tissues in many other parts of the body, neurons can and do grow throughout your life, adding a whole new dimensionto the study of the brain and the illnesses that affect it. 9. The brain itself cannot feel pain. While the brain might be the pain center when you cut your finger or burn yourself, the brain itself does not have pain receptors and cannot feel pain. That doesn’t mean your head can’t hurt. The brain is surrounded by loads of tissues, nerves and blood vessels that are plentyreceptive to pain and can give you a pounding headache. 10. 80% of the brain is water. Your brain isn’t the firm, graymass you’ve seen on TV. Living brain tissue is a squishy, pink and jelly*like organ thanks to the loads of blood and high water content of the tissue. So the next time you’re feeling dehydrated get a drink to keep your brain hydrated.